It’s probably inappropriate for a philistine like me to make any kind of comment about the Musikverein. In golf, it would be Augusta. In football, Wembley. In art, the Louvre. The Musikverein is actually the name used for the Gesellschaft der Musikfreunde in Wien, which translates roughly as the Society of Friends of Music in Vienna. The term is also used for their concert hall, technically the Musikvereinsgebäude or Musikverein Building. The venue opened in 1870. Like so many great constructions of the time, it used land freed up by the removal of the city fortifications. The society itself dates back to 1812, once putting on Handel’s “Samson” for delegates to the Congress of Vienna in 1814, when Europe’s great powers decided on the future of the continent. Beethoven, Liszt, Bernstein and Abbado, to name but a few, were honorary members, and Salieri was the first director of its singing school (now the famous University of Music and Performing Arts Vienna). So, yes, it’s a society rich in tradition. As for the venue, well, Strauss and Mahler premiered compositions here. Schoenberg directed here. Brahms worked here. When I walked past, the great cellist, Yo-Yo Ma, was about to perform (sold out, of course). It’s also home to the Wiener Philharmoniker (Vienna Philharmonic), perhaps the world’s finest orchestra, and host to the New Year’s Concert, perhaps the world’s most watched classical event. There’s even a shop around the back that sells pianos. Not just any pianos, but Bösendorfer – suppliers to the Imperial royal court and in business since 1828. Brahms, Strauss and Mahler were fans, apparently. Not bad in terms of celebrity endorsements. The Musikverein is classical concert heaven. Look at any list of the world’s greatest concert halls and it’s invariably at the top. The official website has all the details of forthcoming concerts at one of the seven halls within. You can buy tickets online from them, too: use their event search filter to limit the results to those concerts where online tickets are still available. If you want to buy in person, note that the ticket office is not accessed through the main entrance. If you’re facing that entrance, go left around the side of the building. There is an alternative to a concert ticket if you wish to simply see inside. 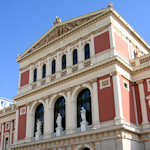 The Musikverein offers behind-the-scenes tours in English on most days. See here for details. The building is very central and easily reached by taxi or public transport. Subway: The Karlsplatz station is almost opposite, and accessed via subway lines U1, U2 and U4. Tram/bus: It’s just a short walk from the Oper/Karlsplatz stop on various tram services, including the 1, 2, 62, 71 and D lines. The 59A bus stops here, too.